A faded copy of Look Back in Anger has been collecting dust on my shelf for over ten years. In preparation for my review of FeverGraph’s “physical and auditory deconstruction of John Osborne’s classic text”, I finally cracked it open to see what it might have to say to me. This is precisely what FeverGraph has done: dusted off this play to unveil whatever insight it offers now, almost sixty years after it was written. The venue at 1093 Queen Street West has a rough, transformed-space atmosphere. The performance area is long and narrow, with the audience facing each other at opposite sides of the stage. There is a very intense intimacy with the actors that results from such close proximity; they are, at times, only a foot away from the audience. The performance has already begun even as the audience takes their seats. All of the actors are present and engaged in shuffling through the clutter of newspapers that dominates the set. It feels as if we are intruding upon a moment of deep reflection in a very private space. This production incorporates all of the key props specified in the original text, but Anita La Selva, in her direction and design concept, has allowed the newspapers to run wild; they paper the walls, they are read and torn, stamped down and thrown around. They are the stuff of everyday life that these poor characters must always wade through in their attempt to grasp whatever it means to be civilized people. The impression one gets of these four characters is that they are locked in a vicious game. While each of them is, in turn, quite playful and endearing, they are all desperate and distraught… and so this game is often hurtful. We are invited into their suffering to discover the ways in which class structure and their own personal demons conspire against their affections. There is Jimmy, a playful loudmouth with a mean streak. His wife, Alison, endures his vicious taunts for private reasons of her own. Cliff, Jimmy’s friend, clings to these two and their strange dynamic to satisfy his own yearning for human contact. And finally, there is Helena, Alison’s friend, who, for her own reasons, manipulates Alison to leave the abusive Jimmy. What this production has done is highlight key moments from the script and examine them through sound and movement. The naturalistic action of the play halts, and we are given a glimpse into the inner worlds of these characters through very insightful mime-work. These segments do not distract from the action; they are an enhancement of the emotional and thematic concerns of the story. Eli Ham is an imposing presence. His Jimmy is at once playful and dangerous. He is vicious, but not cruel, with a sense of entitlement that results from having been wounded and survived. Tosha Doiron embodies the fragility and stoicism that makes Alison a truly heartbreaking character. She is frustrating and endearing in equal measure. Zoe Sweet’s portrayal of Helena is nuanced. She can be perfectly cunning or coy, depending on whichever will serve her best in any given moment. Adriano Sobretodo Jr., as Cliff, is a portrait of watchfulness. The script does not afford him any of the grand scenery chewing that the other characters have in common, but he is a quietly fascinating presence. As the three lash out at each other, I found myself always looking towards Cliff hoping to find in his face some clue to understanding the strange world these four inhabit. The crux of the play is the burden placed upon love by classism and misogyny. I watched these poor people provoke, torment and cling desperately to the each other. At the end of it all, echoing through my head, was Cliff’s line: “I love these two people very much. And I pity all of us.” Yes, love can be a scary, violent and devastating game when the players are so damaged. This is an exceptional production. The performances are raw and probing. The conceptual flourishes illuminate Osborne’s dark mediation on human dysfunction. Fevergraph’s re-examination of Look Back in Anger is not to be missed! 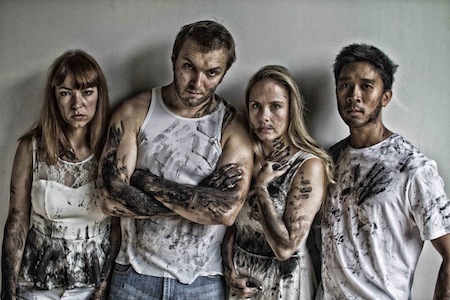 Photo of Zoe Sweet, Eli Ham, Tosha Doiron and Adriano Sobretodo Jr. provided by the company.